It has been a while since our last edition, in which we talked about the past of Ludlow Street and how this landmark of the Lower East Side transformed itself to became one of the hippest areas in town. We also revealed the past of Aragon, the city where Angel Orensanz and his brother Al Orensanz (who will be publishing a book soon, so keep your eyes open!) were born. Finally, in that issue we told you about the contemporary artists Marilyn Minter and Walter Urbach. Want to remember? Just click here! This time, we will tell you the story of how objects became artifacts through time, how they change and represent who we are and the time we live in. Also, we will talk about the Black Panther party and their relationship with the Angel Orensanz Foundation, in fact, did you know that Spike Lee, who directed the “Huey P. Newton Story” has a new movie? Yes, Red Hook Summer! Finally, we will tell you where Angel Orensanz has been and what he thinks about the English artist Sir Roland Penrose. One more thing, we interplay the connection between absence and presence. Curious, excited? No worries! Just click here and have fun! Some people like to collect morbid pieces, some people collect trash, both some other people see as valuable. And both are saved in museums. Joanna Ebestein is the owner of the Morbid Anatomy Library, that suffered a loss this year because of a fire, but it is back on its feet with the help from many people that also have an appreciation for the morbid. 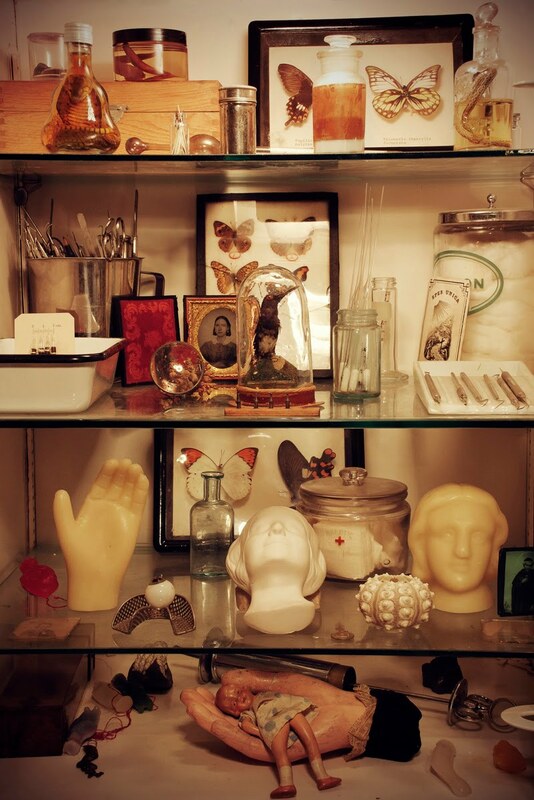 The museum is a collection of curiosities, books, artworks, photographs, ephemera, and artifacts relating to medical museums, anatomical art, collectors and collecting, cabinets of curiosity, the history of medicine, death and society, natural history, arcane media, and curiosity and curiosities broadly considered. The 40-year-old blonde Ebenstein, who travels the world giving lessons and photographing arcane museums, founded The Morbid Anatomy Library in 2007, using as reference and inspiration The Mutter Museum, in Philadelphia and The Museum of Jurassic Technology in Los Angels. Nelson Molina also likes to collect, but not things related to the dead, he is a trash collector. For years a sanitation worker, Molina began collecting pictures and trinkets he found throughout his route everyday, so he could make his garage locker room corner a little more colorful. His colleagues started to contribute and his collection grew. Now Mr. Molina has almost a thousand pieces and he decided to carefully and playfully arrange it in a big open room cream-colored painted by himself. The sanitation worker has lots of collaborators, just like Ebestein, that help him find the garbage gold, but only Mr. Molina decides which pieces are worthy of display. It is true that the Sanitation Department prohibits employees from taking things for their personal use, but since Mr. Molina is sharing his trash treasures with everyone, it is within the rules. In different ways both Molina and Ebestein bring a reflection for our busy day to day life. The necessity to not overlook our connection to death and also not overlook the beauty in ordinary, thrown away things. 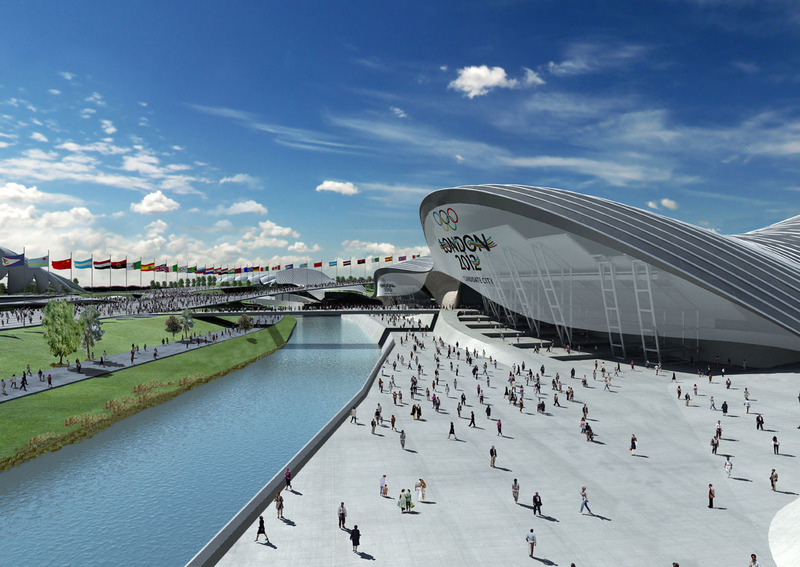 There are only three days left until the biggest event of the year, The Olympic Games! Are you excited for it? What sport do you enjoy the most? Unfortunately art is not in the Olympics anymore, but that is no reason for Angel Orensanz not to participate in London 2012, of course in his own unique way. 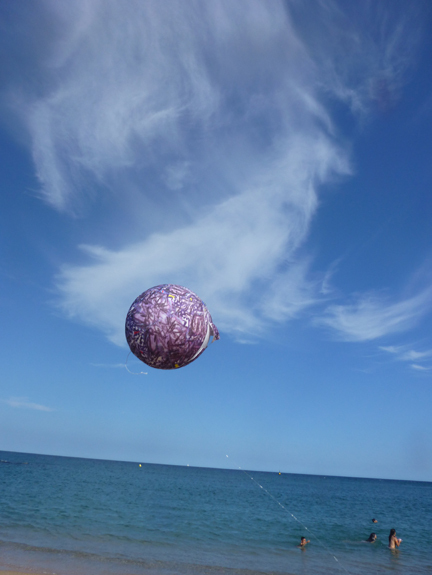 His ritualistic sphere that has traveled all over the world with him now stops in London, more specifically at The Hundred Years Gallery for his take on this year’s games. The renowned Spanish artist cares about issues like cultural difference and identity and works with that in his art. 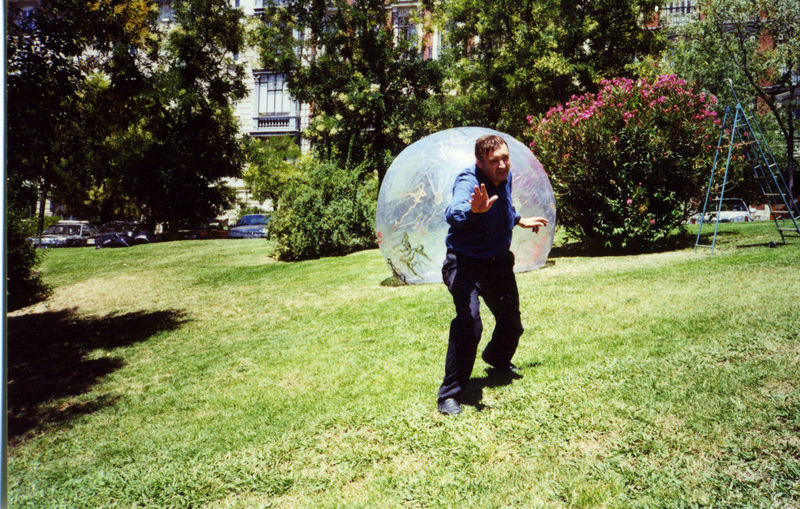 His first exhibition with the sphere was in Venice, where he did “Burning Universe”, in which he walked the 8.5-feet in diameter transparent plastic sphere thought streets, as well as in a Gondola. 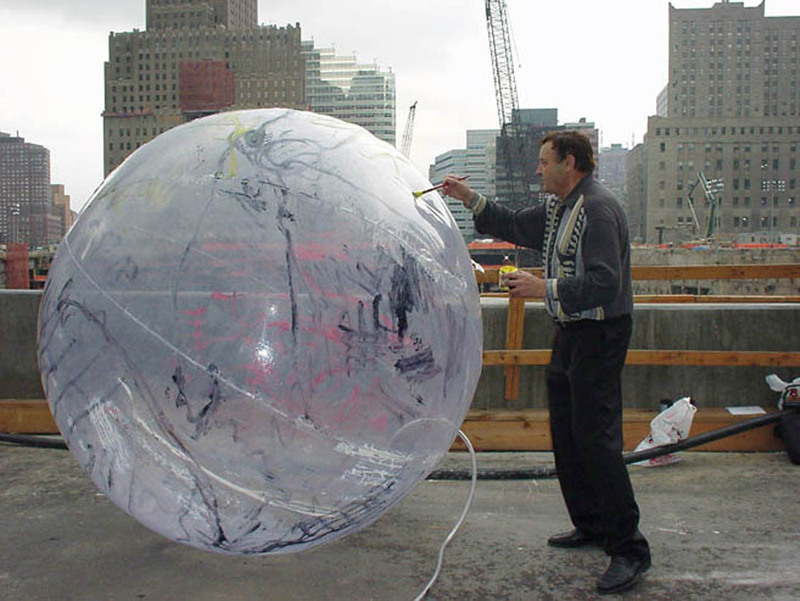 In the same year, Angel Orensanz was invited to expose in Tokyo, where he installed his ball and performed in front of the Senso-ji temple, which was destroyed by American bombs on the World War 2 and reconstructed by the Japanese after the war. Florence was the next destination of the sphere, this time by invitation from the Biennale. 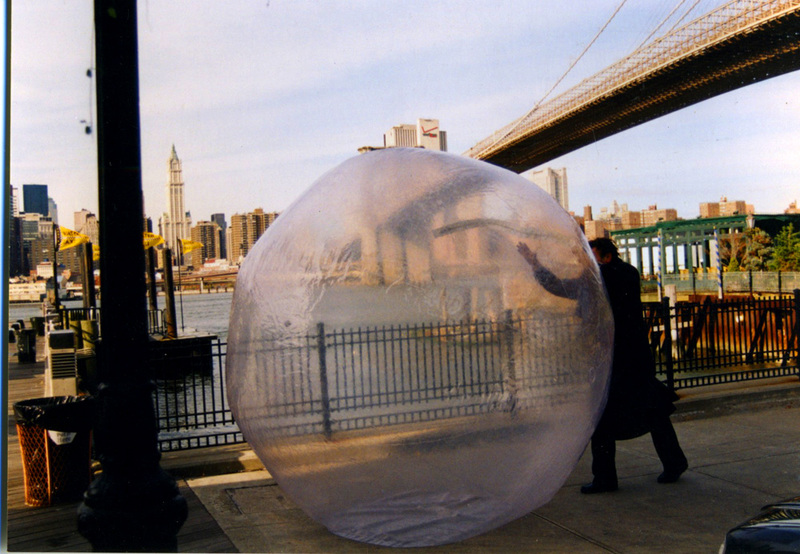 The sphere has rolled the world, Berlin, New York, Madrid, Barcelona, and now London. Aristotle once said “perfect things move in circles” and Angel has truly taken that to heart, using his sphere in different ways for his art. He sees it as a symbol of perfection, of the fullness of being, and of totality, and he plays with the various interpretations of its meanings by making it represent many things in his performances: sometimes throwing it playfully into the sky, sometimes leaving it on the floor, sometimes painting it sometimes leaving it transparent, sometimes, even sealing himself inside it and transporting himself into the art. The opening of his exhibition in the London gallery will happen the same day as the opening ceremony of the Olympic Games, and such as the sphere the Olympics have traveled the world. Also, if you see a sphere from the front, it looks like a circle, or better, a ring, which reminds us of the Olympic symbol, the interlocking rings, that “represent the five parts of the world which now are won over to Olympism and willing to accept healthy competition”, the creator of the symbol Baron Pierre de Coubertin affirms. Healthy competition, cultural difference, cultural identity, it can all be tied to Angel, so it is no wonder he is there with a site-specific exhibition celebrating the Olympics. There has been a lot of talk about Higgs Bosom, the particle that may give others mass. The reason? This particle, that is one of the most important missing pieces of the complicated puzzle that is nature, has, supposedly been finally discovered by the scientists at CERN. And Angel Orensanz wants to be part of the discovery. 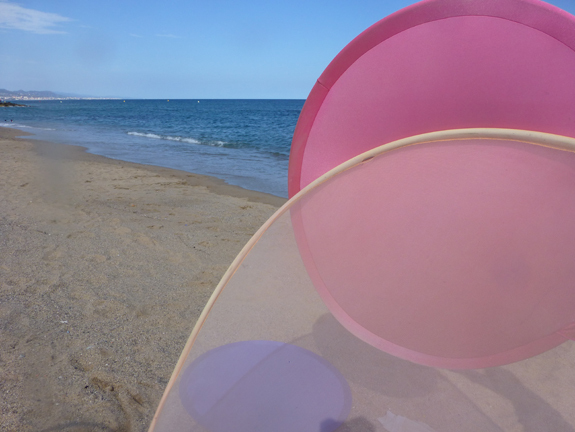 After spending time in Barcelona (his exhibition Time, Space and Innovation is still up on University of Barcelona), Angel Orensanz has gone north in Spain to a place where the sun always shines and the waves constantly hit the sand: Costa Brava. He has been there before, in fact, has been carrying out experiments in Costa Brava for many years. One that many people can still recall vividly was his take on the BP oil spill in the Gulf of Mexico, when he reconstructed a deep water bed of the gulf. 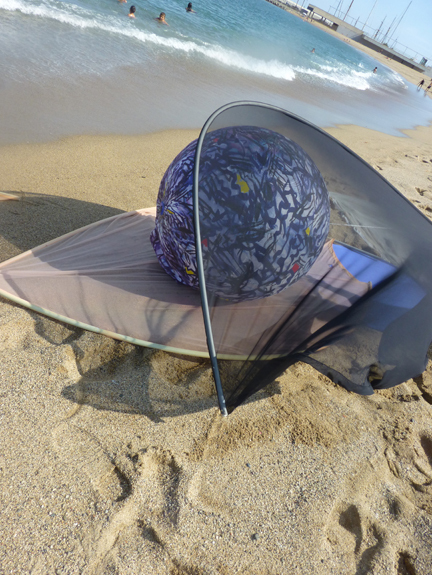 Angel Orensanz, actually, often makes his takes on the happenings of the world and this time he goes back to this beautiful location to pay his homage to the discover of Higgs Boson, with transparent silk in various colors and geometric shapes. An aesthetic recurring in Angel‘s works. Hey Everyone, check out the Angel Orensanz Foundation Newsletter #18. We discuss everything from the hottest artists, the history of the Lower East Side and of course the recent updates of Mr. Angel Orensanz himself! In this article we time travel to parts of the oldest territories of Aragon, one of the uppermost regions of Spain. We explore the controversies and criticism that artists face while publicizing their work as well as many other intriguing topics! Discover a world of breathtaking images, far away lands and a glimpse into a past almost forgotten, all you need is to click here! Whitney fell in love, with the foundation. On February 11, 2012, the entire world paused during the announcement of the sudden death of pop icon Whitney Houston. It was sincerely a shock and a tragedy to loose one of the most outstanding women vocal artists of all time. Houston was only 48-years old. According to the Guinness Book of World Records, Whitney Houston was the most awarded female singer/actor in history. As of 2010 she had accomplished an achievement of two Emmy Awards, six Grammy Awards, 22 American Music Awards, 30 Billboard Music Awards, and a total of 415-career awards. Today the Angel Orensanz Foundation is paying tribute to the this great singer and celebrating her career. Did you know that her 1992 hit single “I’m Every Woman” was filmed here in the Foundation? That’s right! Before the Foundation was even renovated Whitney Houston discovered the remarkable temple and decided it was a perfect location for the video shoot. That day the acoustics of the building were alive again, Whitney sang with power and grace while her crew danced behind her mimicking her vocals with each body movement. In September 2010 Whitney Houston was ranked among the top 100 Greatest Artists of All Time” by VH1. We will always think of her as our number one for gracing us with her talent at the very beginning of our journey as the Angel Orensanz Foundation. 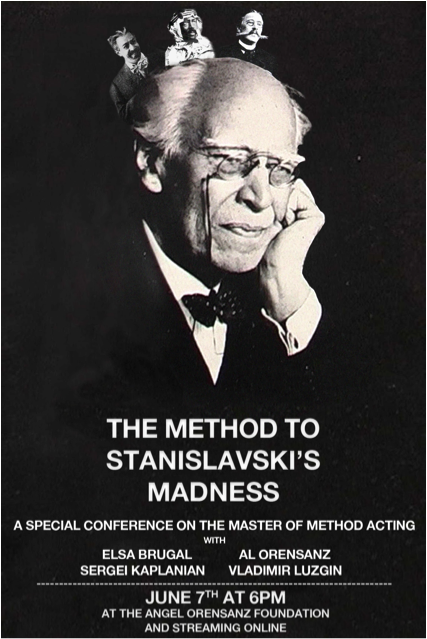 The Angel Orensanz Foundation is hosting an online video conference celebrating the profound impact on acting derived from Russian Actor/theater director Constantine Stanislavski premiering this Thursday at 6 pm. Stanislavski is widely known for creating an acting technique that is continuously used today by an immense amount of famous performers such a Johnny Depp and Jim Carey, called “Method Acting.” This technique infuses psychology into acting by urging the players to discover their characters through their own emotional history. They draw a sincere internal emotional truth to enhance the portrayal of their role on stage. Angel Orensanz is a famous artist/sculptor that works with various medias and is internationally known for the creativity of his instillations. The web conference between Kaplanian, Brugal, Orensanz and Luzgin will feature a comparison between the works of these two talented worldly known men. Don’t miss this opportunity to sit in with people who can open your eyes to the subject of arts and performance.